Canning fresh, local tomatoes — or any produce — at their peak lets you capture their chi and savor the taste of summer long after the season is gone. 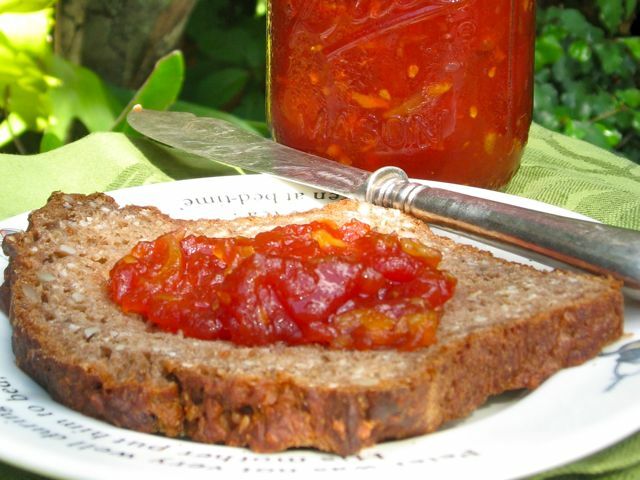 As the owner of Kingsbury Market Garden says, “Our kitchen will be putting tomatoes up as fast they ripen, so that we can use them during the winter season’s lasagnas and braises.” Another bright choice is this funky tomato-ginger preserve. It’s great on homemade bread. The recipe is an oldie but goodie from Indian cookbook author Julie Sahni. The credit goes to her — and to fresh local tomatoes. In a large ceramic or glass bowl, toss together the tomatoes, ginger, and salt. Cover and refrigerate for 8 hours or overnight. Strain all the juice from the tomatoes into a large nonreactive soup pot. Stir in the sugar. Bring to a boil over high heat, stirring constantly. Cook, uncovered, until mixture becomes thick and syrupy, about 10 minutes. Add the tomatoes and the lemon juice. Continue cooking, stirring, until the mixture reddens and reduces, turning thick and jamlike, about 15 minutes. Let the mixture cool, transfer it to a covered container, and refrigerate. This preserve will keep, refrigerated, for up to 3 months.